Parts of the United States would be starved of electricity, water, food, internet service and transportation for a year or longer by the smallest electromagnetic pulse attack on the electric grid, according to a newly declassified report from a federal commission. The so-called EMP Commission report said that the threat is real, jeopardizes “modern civilization,” and would set back living conditions to those last seen in the 1800s. And as a result of the chaos, millions would likely die, according to the report titled “Assessing the Threat from Electromagnetic Pulse (EMP),” from the recently re-established Commission to Assess the Threat to the United States from Electromagnetic Pulse (EMP) Attack. “In the 1800s, the U.S. population was less than 60 million, and those people had many skills and assets necessary for survival without today’s infrastructure. An extended blackout today could result in the death of a large fraction of the American people through the effects of societal collapse, disease, and starvation. While national planning and preparation for such events could help mitigate the damage, few such actions are currently underway or even being contemplated,” added the executive summary. Social Order: Looting requires dusk to dawn curfew. People become refugees as they flee powerless homes. Work force becomes differently employed at scavenging for basics, including water, food, and shelter. Transportation: Gas pumps inoperable. Failure of signal lights and street lights impedes traffic, stops traffic after dark. No mass transit metro service. Airlines stopped. Water and Food: No running water. Stoves and refrigerators inoperable. People melt snow, boil water, and cook over open fires. Local food supplies exhausted. Most stores close due to blackout. Energy: Oil and natural gas flows stop. Emergency Medical: Hospitals operate in dark. Patients on dialysis and other life support threatened. Medications administered and babies born by flashlight. Death and Injury: Casualties from exposure, carbon dioxide poisoning and house fires increase. I didn’t need the list, nor am I persuaded I need to spend any time studying the report. I’ve pointed this out before, and it was only after I began to point out the weakness of the main step-up / step-down transformers at power plants that the FedGov or corporations began to focus on thinking about those key aspects of our critical infrastructure. So let’s paint the picture. Power goes out. It won’t return for a very long time. There is no power to run pumps to get gasoline out of tanks and into automobiles. There is no fuel delivery truck to bring the gasoline to market because pumps don’t work, and drivers are all at home taking care of their families. Hospitals have no power except for urgent and critical care, and what little they can get comes from diesel generators (which will stop running when the fuel runs out). Traffic lights don’t work. Emergency responders don’t respond. EBT cards don’t work because food stores are empty, and there is no cash register to run the cards. We’ve seen how that goes before in Atlanta. Pumps to bring water to urban and suburban centers don’t run. Every family is about 72 hours (three days) away from impending starvation. Looters hit the streets, violence becomes a way of life. This doesn’t just happen with an EMP event, whether solar or weaponized. It happens on a smaller scale with terrorist attacks on the electrical grid. I’ve discussed this at length, so you know this and have been warned, just as I know (and have failed completely to prepare for). Earnest: “Well Peter, we’re still learning of the precise motives of the individuals who carried out this heinous act of violence yesterday. One thing we do know, is the four fire arms they were wielding we’re legally purchased under the laws in place now. So what’s a terrorist to do if he cannot legally purchase guns? There goes the whole plan, out the window. Defenestrate the project and go somewhere else … that’s the only solution. No, a terrorist wouldn’t think of illegally obtaining weapons. And no, this dialogue isn’t fabricated. It really happened. Such is the life of the progressives, where every day is upside down day, where good means bad, up means down, and light means dark. With some 30,000 to 50,000 fighters, Daesh is a relatively small group, and propaganda is central to its growth strategy. Whether hijacking popular Twitter hashtags or using little known distribution channels to post videos to YouTube, their leadership knows that the war of words online is just as key to increasing its power and influence as the actual gruesome acts they commit on the ground. By using the militants’ preferred names, the US government implicitly gives them legitimacy. My oldest son Josh has always used that name for them, and while I was never committed to anything, now that I know they hate it, I’ll always use it and dare them to do anything about it. See also New York Daily News. 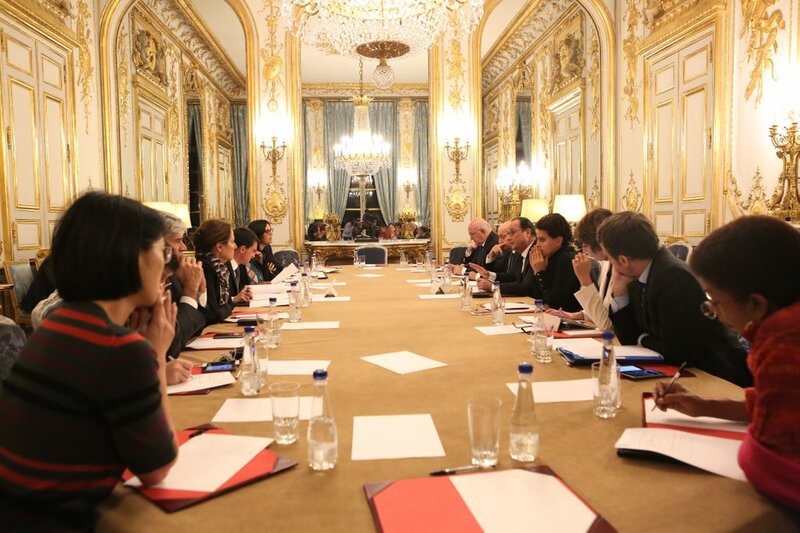 Here is the French government meeting after the recent terror attacks in Paris, where at current rendering almost 160 souls have perished. Look at the bastards, with their fresh water, iPhones and iPads, looking all shocked at the carnage their open borders policy has created. As one might expect, Obama has sped up the process of relocating Syrians to the U.S., and has declared that we have ISIS contained. Obama may as well wear big shoes and a rubber nose, and beclown himself before the world. He does so on a regular basis. But the problem is that he is at the moment a clown with power, doing the bidding of Valerie Jarrett and a gaggle of globalist, international power brokers. Those power brokers apparently want to see the dissolution and the disintegration of civilization, perhaps being bored with things as they are. I was recently watching news reports where French men went to the scene(s) of the shooting to beg for the lives of their wives. Why exactly their wives were there and they weren’t is a mystery that must require understanding the French in order to sort out. Don’t be them. Understand that there is a real threat inside the U.S., whether from ATF or EPA or police or [fill in the blank] SWAT teams, or MS13, or Islamists. Their goal is all the same – to enslave and ultimately to kill you and your loved ones. There will be no mercy, there will be no way out, no matter how much you beg. Guns, ammunition, and practice, family, clan and tribe. Do it. Prepare now. Time is short. Your loved ones are counting on you. John Jay has thoughts here and here. WRSA has coverage here. Mark Steyn’s comments are always worth reading. “So I say again: What’s the happy ending here? Because if M Hollande isn’t prepared to end mass Muslim immigration to France and Europe, then his “pitiless war” isn’t serious. And, if they’re still willing to tolerate Mutti Merkel’s mad plan to reverse Germany’s demographic death spiral through fast-track Islamization, then Europeans aren’t serious. In the end, the decadence of Merkel, Hollande, Cameron and the rest of the fin de civilisation western leadership will cost you your world and everything you love. FBI has nearly 1000 active ISIS probes ongoing. Via SWJ, Georgetown University has published a report entitled Lone Wolf Terrorism. In it you’ll find this rich bit of analysis. … a University of Maryland study found that, while radical Islamic terrorism in the United States has increased since the attacks on September 11, 2001, there has also been a continued, if not greater, increase in individual radicalization from the far right. Overall, homegrown radical Islamic terrorism poses no greater threat to the public than other forms of domestic radicalization, but by unfairly focusing on the Muslim community, the USG risks inciting further divisions. What you know with certainty is that the idiots at the “think tanks” still have no clue as to the dangers posed by Islam and Sharia law. Thus they are an irrelevant feature to the national security apparatus, shouting nonsense with no one listening, sound and fury signifying nothing. But we knew that before, didn’t we? The head of the National Security Agency and U.S. Cyber Command admitted Thursday China can shut down the U.S. power grid, Fox News and the Associated Press reported. Admiral Michael Rogers made “the grim forecast” before the House Intelligence Committee, confirming what has been “widely known” but never officially owned up to, the report noted. “Rogers said he believed China along with ‘one or two’ other countries had the capability to successfully launch a cyber-attack that could shut down the electric grid in parts of the United States,” the report noted. David goes on to note the extent to which normal life would be affected by such an exigency, and then poses the following dilemma for anti-gun activists. With that as backdrop, and understanding that the potential for such horror unfolding in the homeland has been formally taken out of the realm of dystopian fiction and now reflects real world concerns of those responsible for overseeing the nation’s first line of defense, activists who demand “common sense gun safety laws” will face a moral choice should officials’ worst fears come to pass. David is right. But it’s even worse than that. I am not bragging – well, perhaps I am – but before the government told you about the vulnerability of the electrical grid to attacks, before the FERC told you, before the DHS mentioned it, I told you about it based on things I know first hand. My attack was physical in nature, while this report focuses on cyber-attacks. The short term affect is the same, but the long term affect is far worse in my scenario. In my scenario the very structures, components and equipment used to deliver power (step up transformers) that are needed to manufacture the replacement step up transformers are unavailable due to the attack, so the industrial power isn’t available to make the transformers. And without the attack on large transformers, there is no need for the manufacture of new ones. It’s the perfect horns of a dilemma to the terrorist. None of the formal reports I have read go much further in developing this threat matrix, except to show that there are just over half a dozen large substations that, if taken out, would leave the vast majority of America blacked out. In this scenario, food, gasoline, the financial system, trade and traffic, traffic lights, power for hospitals, and delivery of necessary medications, would cease or be completely unavailable. Now who doesn’t want a gun of some sort for self defense? In July 2012 the Small Wars Journal published Full Spectrum Operations in the Homeland: A Vision of the Future. It was a touchstone marking their descent into weird collectivism and illegal military operations by the armed forces of the U.S. The specific scenario was stupid beyond belief, where “extremist militia” takes over the government of Darlington, South Carolina. My son and I got a good laugh out of that one. The only insurrection against the local government of Darlington might occur as a result of losing the one remaining NASCAR cup race, but as an aficionado of South Carolina, I can vouch that federal troops won’t be the savior of Darlington. They might be the target, but the local Sheriff is just as likely to side with the militia. But laugh as we might, this is serious business, and marks a dark moment in the history of our military. They are now willing to say out loud what wouldn’t have even been thought a hundred years ago. Small Wars Journal continues its theme with Political Violence Prevention: Profiling Domestic Terrorists. The paradigm the author seeks to build is right up front. … the process of becoming a violent extremist is a series of steps that leave footprints we should be able to track”. A national standard from which to identify individuals who have left these footprints and are on the path to becoming violent would be invaluable to law enforcement, especially at the local level. Without a set standard each local law enforcement agency interprets who may or may not be a threat and what is worth reporting or investigating differently as they have different experiences and expectations about domestic terrorists and terrorism. Domestic terrorists can be identified prior to committing any terrorist attacks through a profiling systems based upon identifying factors that influence committing acts of terrorism. The entire effort is worthy of funding and support, according to the author. The area in which profiling could be useful is in identifying Lone Wolf terrorist attacks as they are executed nearly twice as often as other attacks. This is under the assumption that Love Wolf attacks are more successful because the clues that alert the general public and law enforcement are less apparent or non-existent. It would also involve an intelligence agency to track the individual over an extended period of time. An agency that is not concerned with arresting or detaining would be free from the pressures of cased based intelligence enabling them instead to pursue preemptive intelligence where the profiling may be useful (Chalk & Rosenau 2004). In order to prevent domestic terrorist attacks resources should be allocated into improving existing efforts that have proven to be effective as well as into the development and implication of concepts that improve weak areas of domestic terrorist threat detection such as a profiling system. Rifles: Threat To The Nation’s Energy Grid? Oh dear, oh dear, oh dear. I leave for a few minutes and this is what I come back to? Let’s recall that in A Terrorist Attack That America Cannot Absorb, I described in some detail an attack on the main step-up transformers of the fossil fuel power plants in the nation as being perhaps the most serious threat to the economy and infrastructure that this country faced. I also linked two papers on Hezbollah fighters already being in America. I described an attack in which fighters destroyed the transformers completely and thoroughly enough that they could not function. For this article I relied on a colleague at work who knows far more than I do about the subject. David Codrea discusses the Obama administration’s reaction to this same type of threat. Rifles, even .22 caliber models many young people receive as their first gun, are “among the greatest threats to the reliability of the nation’s power system,” U.S. Federal Energy Regulatory Commission Chairman Jon Wellinghoff claimed at a Tuesday Bloomberg Government Breakfast, Bloomberg News reported yesterday. A .22 rifle. When I learned to shoot a .22 rifle, I did my target practicing in my back yard (we lived in the country) using our aluminum trash can lid as a target. The .22 round would penetrate that lid, but not much more. My dad would come home from work, inspect my targeting, and let me continue. Has Wellinghoff ever shot a .22? Rather than focusing on Hezbollah they are focusing on backyard shooting with a .22. Rather than working to shore up the nation’s energy grid and its vulnerabilities, they have put their attention on 200 yard shots taking “the whole thing out!” Nothing about Hezbollah, nothing about securing the border, nothing about additional security infrastructure around these components, but hand-wringing over .22 rifles. This is unserious. It isn’t adult-like analysis. It’s juvenile and childish. As soon as I turn my back, this is the kind of twaddle that the Obama administration comes out with. See, this is why we can’t have nice things. Everything gets broken.